Dieu Du Ciel | Beer Apprentice - Craft Beer News, Reviews, Interviews and Info. 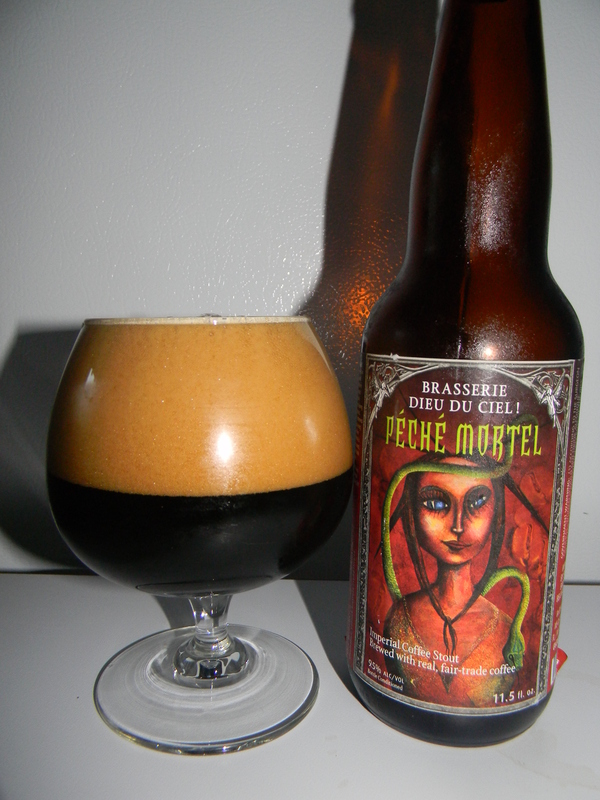 Review of Dieu Du Ciel Rigor Mortis Abt. Hello everyone. 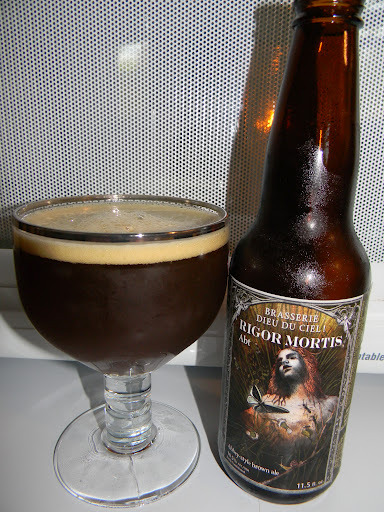 For today’s craft beer review I’m going to be trying the Rigor Mortis produced by the Brasserie Dieu Du Ciel located in Montreal, Quebec, Canada. This will only be the second Dieu Du Ciel offering that I’ve tried thus far, so I don’t really know that much about them as a whole. Let’s see if we can’t find a bit of information on the Rigor Mortis Abt. from the website, dieuduciel.com. This brew comes in an 11.5 oz. bottle and it has an ABV of 10.5%. The Rigor Mortis poured a brown to deep burgundy color. It formed a light tan, smooth and creamy head from a very gentle pour. The size was a touch small, but it showed better than average retention as well as some pretty nice lacing. Once the head settled, it left a ring around the edges of the chalice. Some clear alcohol legs were noticed when tilted as well. The nose announced a good dose of dark fruits. Black cherries and plums mostly. A solid waft of yeast and bread too. A relatively strong vapor of caramel malt added a significant sweetness. A firm hint of alcohol was happened upon also. It wasn’t overbearing, however easily noticed. Honestly, I didn’t find much spice in the bouquet. Overall though, very nice and pleasing I thought. The taste let loose some more of that dark fruit. Again, mostly black cherries and plums. The alcohol became very apparent with the first couple of sips, although it settled and melded very well after only a few moments. The taste seemed very yeasty, doughy and bready to me…… and I liked it. Likewise, the caramel sweetness and sugars were intermingled nicely. Whatever spices that were found seemed to be overtaken by the fruits and sugars. Towards the end, only after it had warmed significantly, I began to taste a slight, but welcomed woodiness, which added a nice parting touch of complexity. The mouthfeel was medium bodied. Very dry, somewhat chewy and smooth. Low to medium strength carbonation was to be had and even though the alcohol was easily tasted, the warmth at the back end seemed quite restrained. Plenty of flavor was left behind after each sip however. Well, to me, this beer only got better and much more enjoyable the longer I let it sit and develop. It really became a lot more balanced, harmonious and easier to drink. It has plenty of character and flavor to ponder as one works their way through the bottle. This beer would fit perfectly with the crisp and cool evenings of the Fall in my opinion. I would love to pick up another bottle or two and put them back for a while to see how they change. I would think that they would lose some of that sweetness and let the bready goodness really step up to the forefront. I’ll say this, if you guys have the opportunity to try the Dieu Du Ciel Rigor Mortis Abt, please do so. I think you may very well like it. Be sure to let me know what you think also. Thanks for reading and commenting everyone. I appreciate the continued support. 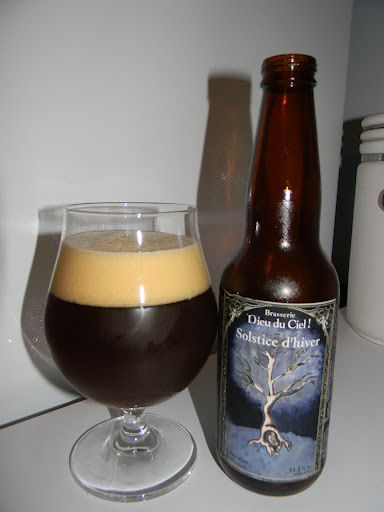 For today’s craft beer review I’m going to be sipping on a Solstice d’hiver brewed by the Brasserie Dieu Du Ciel located in Montreal, Quebec, Canada. I’ve never even heard of this beer or this brewery before, so who knows what we are going to find. From the website, dieuduciel.com, we find this description of the Solstice d’hiver. This noble winter beer is brown in colour with flaming red highlights. Its taste is delicately sweet and liquor-like with a hint of burnt caramel coming from the malt and a prolonged boiling time. It is a very bitter beer with aromas of hops and alcohol, and flavours reminiscent of red fruit brought by the English-type yeast we use to ferment it. The aftertaste is accentuated by the wonderful flavour of hops. Solstice d’Hiver is brewed only once a year, and is then aged for 4 to 5 months before being sold. This aging process is necessary to achieve an ideal equilibrium between the sharp bitterness and the other flavours in the beer. Let’s give it a try, shall we??? This brew has an ABV of 10.2% and it comes in an 11.5 oz. bottle. It poured a very, very dark burgundy to brown color with a very light tan head. The cap had great girth plus it was creamy, soft, fluffy and semi-rocky. The retention time was very gratifying and the lacing seemed quite good too, although after a little while, no lace was left on the glass, but it did leave a thin ring around the edge of the snifter. A fine showing of alcohol feet were left clinging to the sides as it was tilted also. The nose had a wonderful presence of caramel malt along with a well blended waft of booze. Dark fruit hints of raisins and dates were infused with some light woody and leathery tones. A relish of toasted dark breads and mild earthy hops helped to create and round out a nicely balanced aroma. This fragrance was not extremely robust or “loud”, but it did smell rather sweet and proper. The taste beget nice savors of caramel sweetness. A prevalent “booze” stabbed the taste buds at first, however the entire alcohol tone subsided as the palate adjusted. The dark fruits of dried raisins and dates were a bit more relaxed as well, but I still got enough flavoring from them to satisfy me. An earthy, herbal hop bite and bitterness were discovered, but it seemed as though the “woodiness” and “leathery” flavors were a tad more reposed than they were in the aroma. Again, pretty well balanced and tasty, but just a bit mild in comparison to some other Barleywines out there. The mouthfeel was a sturdy medium to medium/full. Smooth, slick and chewy all around. It had some very nice carbonation and a nice little burn at the back end that gave way to a very pleasant warmth after a few sips. Plenty of flavor was left behind on the palate after the swallow too. Well, we have another very good beer here. Not “world class” in my opinion, but still pretty darn agreeable. Even though it may be a touch complacent, it still had plenty of aroma and flavor to suit most anyone I would think. It seemed to have a similarity to an English Barleywine instead of an American Barleywine (more malt forward and with a feeble hop presence). It’s a sipper for sure, but still an easy drink I thought. If you favor Barleywine styled beers, I’d definitely say to give this a shot if you see it. I know I wouldn’t mind having it again if given the opportunity. With that being said, let me know what you think of the Solstice d’hiver once you try it. Thanks for reading and commenting guys. I’m thankful.